New Delhi, 17 January 2017: New Year is celebration time with family and loved ones over picnics and parties. This New Year, Cornitos, the popular nacho crisp brand, brings Hot Flavor Combo pack to make your celebrations special and be a part of your cherished memories. 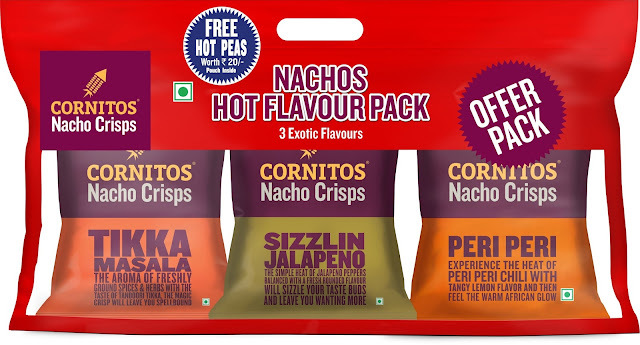 The Cornitos Hot Flavor Combo pack consists of 3 packs of 60g nacho crisps featuring three of its star flavors. The tantalizing trio of Sizzlin Jalapeno, Tikka Masala and Peri Peri, packed in attractive polybag would complement your New Year parties, picnics and those impromptu road trips. That’s not all. With this Offer Pack, a pack of Hot & Spicy Coated Green Peas worth Rs 20 is also absolutely free. Now, that’s what we call a real steal deal. Send well wishes to all your friends and family with Cornitos Hot Flavor Combo pack in 2017. So grab the Offer Pack and get the party rolling!